Originally from Pennsylvania in the United States, I now call New Zealand home. I earned a bachelor’s degree in natural resource management with an emphasis on environmental education at the University of Michigan. I married a fellow student, and we celebrated our first three wedding anniversaries in the Republic of Panama serving as Peace Corps volunteers. Upon our return to the United States, I embarked on a career as a heritage interpreter/environmental educator, with a brief break to get a Master’s degree in Entomology at Penn State University. My thesis work focused on teaching high school students about integrated pest management with hands-on science-based activities. Naturalist at Camp Tamarack, where I got to care for and teach with an 8-foot long Burmese python named Ka, and where the staff housing looked out over a lake that was home to sandhill cranes. 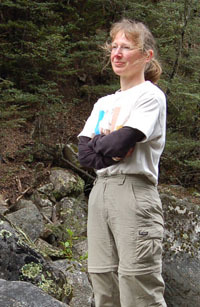 Program Director at Shaver’s Creek Environmental Center, where I got to teach all ages, from preschoolers, to university students to adults, including a fun and exhausting International Ecology Camp for the Japanese All-Star Little League team. Senior Naturalist at the Lee and Rose Warner Nature Center, where I enjoyed canoeing on the lake with kids and teaching snowshoe programs. In 2005, we moved with our two young children to New Zealand, where I started a heritage interpretation consultancy and a science outreach business called The Bugmobile. Ten years later, I needed a new challenge, so I closed my businesses in order to focus on writing. I write from my sunny office at Crazy Corner Farm, where I grow much of the family’s food, and provide comic relief to the neighbours, who are all real farmers. You can find links to my published writing here.